Click here to visit our list of all the main holiday camps which were around in the 1960s and '70s. When Billy Butlin opened his first site at Skegness in 1936 a number of other camps were already in existence offering similar chalet accommodation, meals and entertainment. He didn't invent the holiday camp idea but simply took it to a much higher level. The Skegness camp offered more than anything ever attempted before and the immense scope of entertainment and attractions, along with the high-class interior features of many of the public buildings, was way larger and more impressive than anything ever seen in Britain. This huge "mega-camp" tradition was continued with all subsequent Butlin sites and the company never had any direct competitors who could offer the same vast range of entertainment. They really were in a league of their own. 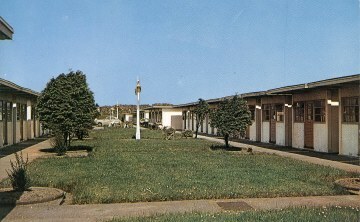 The first holiday camp had actually been in business for over 40 years when Skegness opened. Cunningham Young Men's Holiday Camp had opened in the Isle of Man in 1894 and by 1908 had acquired all the familiar characteristics of the later camps. Campers (men only) stayed in row upon row of candle-lit tents and facilities included a heated indoor swimming pool, a selection of shops, a huge dining hall, bank and concert hall. It even had it's own miniature castle which housed the toilets and washrooms! Campers were encouraged to take part in all kinds of activities including sing-songs and team games. 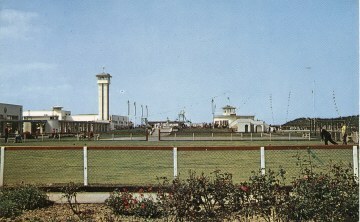 Advertised as "The largest most popular holiday resort in the world" the camp remained open until just after the second world war. Turning to England the first major camp was at Caister in Norfolk which opened just after the turn of the century. Others soon appeared nearby and this stretch of coast soon became swamped with an assortment of camps (at one point there were 14 within a ten mile radius). One of these early pioneers was the Potters Camp which first opened in 1924 (later moving to a new site in 1930). Upon opening it could boast of such luxuries as "brick chalets with running water, electric light and modern toilet facilities....a brick sun-lounge, lavishly furnished with expensive carpets and modern easy chairs". This highly regarded camp is still open today. Another local entrepreneur was 'Maddy' Maddieson who opened a nearby camp at Hemsby, shortly followed by a second near New Romney in Kent. Turning to North Wales we see the appearance of the Golden Sands camp at Rhyl. Opened in 1933 the 20 acre site consisted of tents, chalets and a vast central pavilion housing the dining room and entertainments. Another opened on the other side of town shortly after, known as the Robin Hood Camp - both are still open today. Several camps even opened at inland locations including such sites as the Robinson Crusoe camp in Berkshire which boasted of chalets built high up into the trees! After the success of these early commercial operations, a number of non-profit cooperative camps were established by various trade union groups. The first was the Roseland Summer Camp at Rothesay in Scotland. Opening in 1911 this camp lasted right through until 1974. Another was the Coventry Cooperative camp at Voryd in Rhyl which also lasted well into the 1970s. Another organisation was the 'Civil Service Holiday Camps' which opened it's first site at Corton in 1924 and it's second at Hayling Island in 1930. The NALGO union also became involved with the opening of a camp at Croyde Bay in Devon (1931) followed soon after by a much larger site at Cayton Bay near Scarborough. Both boasted of "waterproof" chalets along with recreation rooms, concert halls, swimming pools and a whole host of daytime and evening activities. Cayton was sold in 1976 but Croyde Bay is still thriving and now owned by UINSON. All this activity therefore happened before the first Butlins camp had even been built. There were many others too numerous to mention but the basic concept and idea had been pretty well developed by the time Billy Butlin became involved. After the war the holiday camp boom reached new heights (helped somewhat by the cheap availability of old wartime military bases) and a couple of other entrepreneurs soon became household names, Harry Warner and Fred Pontin. In fact Warner had opened his first camp in 1931, some five years before Butlin entered the scene. Pontin got started in 1946. Additional info on both companies can be found in our relevant Pontins and Warners pages. By the early 1960s there was a total of around 100 registered holiday camps in the UK. However Butlins were still the market leader and the total attendance of all the other camps combined didn't even come close to the one million plus holiday makers that headed to Butlins every year. The industry saw some major changes throughout the '70s and '80s and many of the old camps disappeared. But an interesting fact is that most of today's survivors can trace their origins back to those early pioneers. Most are unrecognisable today and caravans have replaced many, if not all, of the old chalets. Below are a couple of postcards dated 1952 showing the Prestatyn Holiday Camp which was designed and built by the LMS Railway & Thomas Cook in 1939. Noted for its wonderful architecture the camp was later sold to Pontins and renamed 'Tower Beach' but was eventually closed in the 1980s.